On behalf of admin of JML Law, A Professional Law Corporation posted in Car Accident on Saturday, Dec 16 2017. A hit-and-run incident, or rather a shoot-and-run incident, recently made headlines in Riverside. While the investigation is still underway, the media has learned new details about the alleged attempted murder. New surveillance photos were released to show the vehicle involved in the shoot-and-run incident in west suburban Riverside in early December. As a result of the shooting from a white SUV, two cars parked in the driveway were damaged with bullets, while four occupants of the cars weren’t injured. The Riverside police believes that the white SUV was targeting the four men in an attempt to murder them, though the motive remains unclear at this point. A black male, Hispanic male and female were reportedly inside the SUV at the time of the shooting. After the incident, the vehicle drove off eastbound toward Harlem Avenue. The police is still investigating the shoot-and-run incident, and no one has been taken into custody. How many Americans carry guns in their cars? Our car accident attorneys at JML Law are keeping a close eye on the developments in the incident, as perpetrators resort to shoot-and-run to injure and murder Riverside residents more often than ever. It’s not the first time perpetrators have used a car in an attempted murder case, according to our car accident attorney Riverside CA. And it makes sense since fleeing in a car is much faster than fleeing on foot. However, cars and other vehicles are being used in a hit-and-run and shoot-and-run incident not only for injuring or killing targeted people intentionally. A driver may flee the scene after resorting to a gun in a bout of road rage. Or a reckless driver that points a gun at another driver tailgating him in attempt to scare him off (and fires it accidentally). Fact: an estimated up to 25 million Americans carry guns in their vehicles. While most of them use guns solely for self-defense purposes, others may carry guns for vile purposes. A 2014 study by the Annual Review of Public Health revealed that while cars still kill more Americans than guns, firearms have been exponentially catching up in recent years. How to find drivers responsible for hit-and-run? You don’t even need to own a car to be a potential target of drivers fleeing the scene after hitting pedestrians with their vehicles or shooting at them. Since locating such drivers is nearly impossible if the perpetrator escaped in an unknown direction, it’s vital to hire a Riverside car accident attorney to launch an independent and thorough investigation. 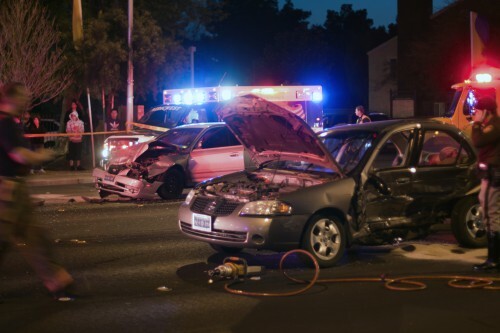 Our car accident lawyers at JML Law have proven to be more effective in investigating hit-and-run incidents than police officers, and we have proven track record of going the extra mile to find drivers responsible for hit-and-run or shoot-and-run incidents. Our best attorneys can access surveillance footage from nearby buildings and red lights in order to locate the suspect. Once found, drivers guilty of hit-and-run face severe consequences for committing this type of crime. A hit-and-run driver in Riverside may be charged with either a misdemeanor or a felony, which could result in up to three years in jail and up to $10,000 in fines. Consult our Riverside car accident attorneys at JML Law to launch an efficient and thorough investigation into your hit-and-run accident. Learn about your best legal options in your particular case. Call at 818-610-8800 or send email to get a free initial consultation.